Indonesia with diverse cultures and exotic islands. 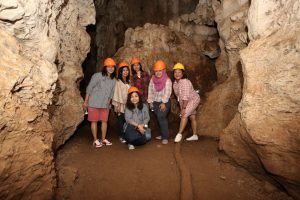 We pack a tour package Waerebo & Komodo Tour is designed for you who love Indonesian Culture and Love of natural wealth and Flora and Fauna are abundant. Now you will visit 16 enchanted destinations in West Flores and Komodo National Park in just 6 days! 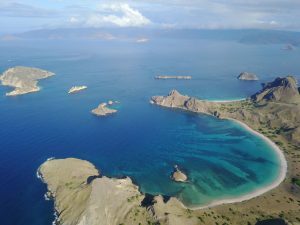 Including: Kampung Adat Waerebo, Dintor, Mules Beach, Lembor, Dintor, Labuan Bajo, Padar, Komodo Island, Pink Beach, Gili Lawa / Profit, Siaba, Sebayor, Kanawa, Traditional Market, Bukit Cinta and Batu Cermin. Good morning, After breakfast at 07.am we will be taken to trekking starting point at kampong Denge. This is where you will start Trekking along the 9 km (2.5 hours) all the way up to Waerebo which is at the elevation of 1,200 (m asl). 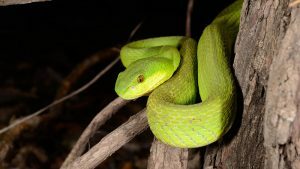 You will observe the flora of virgin forest as well as wildlife along the way like endemic birds (bare throat whistler). 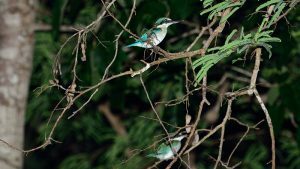 Trekking trip will be accompanied by a bird concert. 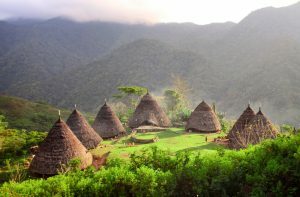 There are 2 stop points for you to enjoy the cool air in the Waerebo forest and the beautiful scenery of Poco Roko that Waerebo people usually come to call relatives and family outside the area and Nampe Bakok. When you reach the Hut of Mother’s love, you are obliged to ring the bamboo stool to indicate that you are coming. You will be welcomed by Waerebo traditional elders in Taing Wae Lu’u ceremony (symbol of appreciation to the ancestors) afterwards you are invited to Niang’s house for lunch. After lunch you will be invited by the guide to visit the 7 custom houses that have been awarded by UNESCO 2012. You will interact with local residents, dinner and sleep in traditional house (Mbaru Niang). Early morning you’re served with Waerebo, yummy! While drinking coffee you will see the sunrise in the village, after breakfast you may want to buy coffee beans or coffee flour Waerebo then packing and trekking home on the same track track. The car will pick you up at Denge village and go straight to Waerebo lodge for lunch. After lunch the trip will continue to Labuan bajo. Arriving in Labuan Bajo you will get our Complementary Massages for 1 hour at your hotel stay or in SPA shop. Dinner at Lepirate Restaurant or similar. After breakfast, we will pick you up at Hotel and directly escorted to Labuan Bajo tourist jetty using air-conditioned car to start your escursion to Komodo National Park the first destination is Padar Island, which is the 3rd largest island within KNP. On the island of Padar we will take you trekking to the top to see the panorama of landscapes and indentations of three unique colors of the beach is very impressive. Capture the moment Puncak is ideal with your beloved or your friends. 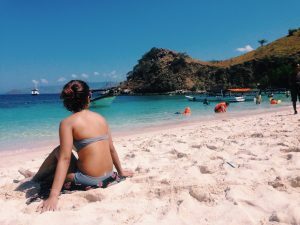 Return to the boat and continue to Pink Beach Snorkeling to see the beauty of the marine park (coral reefs and colorful fish) as well as the soft pink sand beach like a crystal. Sailing to Komodo Island for about 30 minutes, Arriving at Komodo Island you will be greeted friendly by Ranger / Pawang Komodo who will guide you in the exploration for trekking, observing the survival of KOMODO stars and other wildlife in their original environment such as wild buffalo, wild horse , Monkey, Deer deor, Boar, snake and several species of endemic Birds. After the trekking is complete you will be escorted to Gili Lawa Island, the island is very famous for the enchanting viewer, you will spend the 4th day of the tour at the peak to enjoy the sunset and beautiful scenery that pamper the eyes. Dinner and dinner in the dyke Lawa decorated by stars and milky way in the sky. We will awaken you at 4.30 for trekking to the top of Gili Lawa to watch the sunrise rising just east of Labuan Bajo, the colorful sunrise, it slowly gives us time to capture the historic moment of sunrise at the top of Gili Lawa. Then we return to the boat for breakfast while sailing to Siaba. 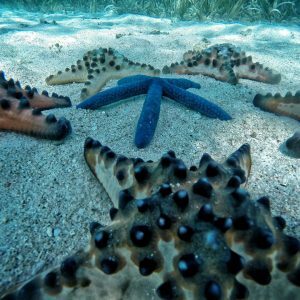 Siaba is famous for its Turtle heaven snorkeling spot where turtles are easily seen, especially hawksbill turtles and green turtles. After that move to a small area to snorkel to see the coral reef and lunch on the way to Kanawa. In kanawa you will swim, snorkel and relax on the white sand beach or relax on the wooden pier while watching the fish play on the coral reef. After that sail home all packed clothes and we immediately take to your hotel. Farewell party at Paradise Bar? You will be picked up at the hotel and delivered directly to Wae Kesambi, Labuan Bajo using air-conditioned car. After exploring the various commodities in the market, about 10 minutes by car you will arrive at the post ranger mirror stone to fill the guest book. Before exploring the cave you are given a head protector helmet so as not to hit the rock and led by a local guide in a mirror to see bamboo forests, stalagtite, stalagmite, crystal stones, coral and some fossils of marine animals such as turtles and groupers. Inside the cave you will see the reflection of the refracting light into the main room of the cave. So the cave is named Batu Cermin. After the exploration is complete, we will ask you to visit Bukit Cinta, this hill is actually the same hill as any other hill but this place is perfect for couple of lovers to enjoy sunset or sunrise also young couple in Labuan Bajo often mengunjingi this hill. 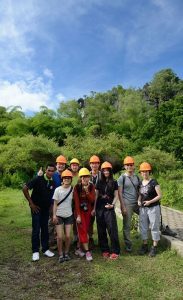 Apart from that the excess is the view of the sea view point and landscape view is very captivating that makes everyone who visit it feel is not being in Labuan Bajo but in the Savannah field. After that, we will take you to the art shop near Komodo Airport. After sopping, lunch and check in at Airport. Trip end!